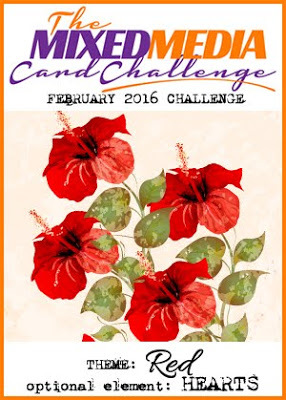 It's the first day of the month - and time for the February Mixed Media Card Challenge! The challenge this month is Red - Optional elements: Hearts - just in time for Valentine's Day - although as you can see in the inspiration photo - it doesn't have to be for Valentines! I'm making Valentines to sell at my church next week - so I did go with the Valentine Heart theme for my card. My card is larger - 6 1/4" "x 6 1/4" to accommodate this lovely Heart and Flowers Stencil from Stencil Girl. First, I stenciled on a panel of white card stock using the Wendy Vecchi Check Mate Stencil with Wendy Vecchi Geranium Ink, Then I laid the heart stencil over the panel and went over it with Wendy Vecchi White Embossing Paste. I doodled a dotted line around the heart to more clearly define it using a black Stabilo pencil. 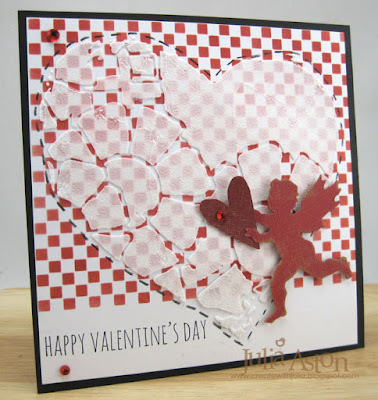 I used Tim Holtz Movers and Shapers Mini Lovestruck dies to cut the cupid and heart out of red Kraft Core Cordinations papers. I lightly sanded them after cutting to reveal some of the kraft core. I glued the heart to cupids hands and layered them over the embossed heart with foam dots. I stamped the sentiment directly onto the panel. Since my card is oversized - instead of making it a card that opened - I made it an easel card that will stand up for display by adding a die cut easel on the back. I also die cut a tag and adhered it to the back so the giver could write something to the receiver. The to: and from: are from Tag Collection 1 by Waltzingmouse. I looped some Maraschino twine through the hole and adhered the tag with foam dots. You'll find the Mixed Media Card Challenge and link up here. You will also find lots of inspiration from the rest of the very talented Design Team there! Paper: White, True Black - PTI, reds - Kraft Core Coredinations. Accessories: Heart Grid Stencil - Stencil Girl, Check Mate Stencil - Wendy Vecchi/Stampers Anonymous, Dies - Movers and Shapers Mini Lovestruck and Small Easel Die - Tim Holtz/Alterations, Tage Sale #2 - PTI, mini sander - Ranger, Palette Knife, Black Stabilo Pencil, foam dots, Maraschino twine - The Twinery, red rhinestones - Kaiser Craft, white embossing paste - Wendy Vecchi. 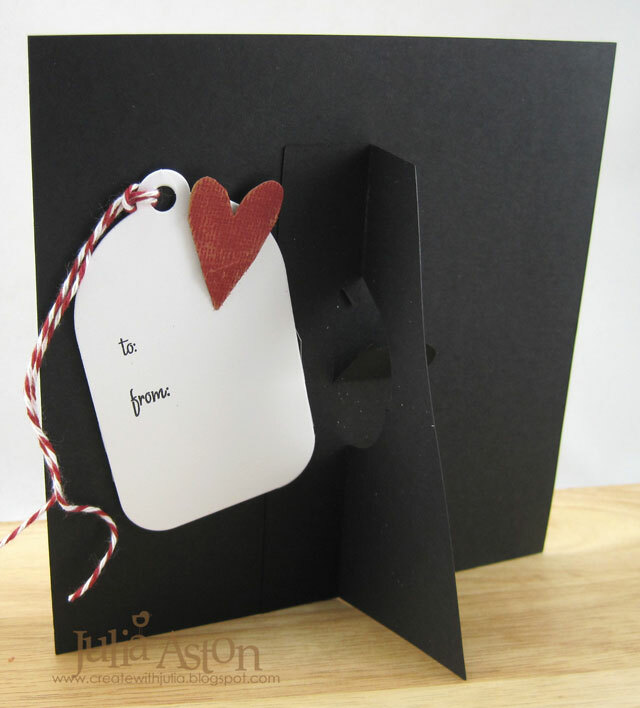 Love the look of the stencilled heart over the graphic paper! And of course, the little cupid completes this beautiful valentine! I have no doubt your card sale will go well, Julia! Just love how that stencilled heart appears to be cracking up - and it works brilliantly over the patterned paper - fabulous! Good luck with the card sale - I'm sure you'll do well. A fabulous design and wonderful crackled heart Julia and I love that it stands rather than opens. Good luck with the sale. this is so awesome.. I love that big heart..
Gorgeous Valentine Julia! 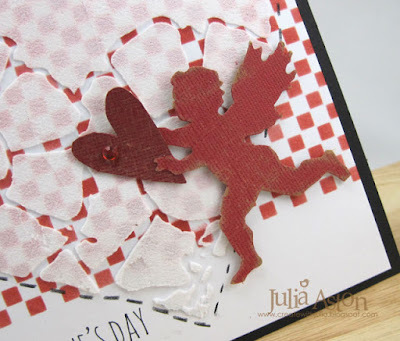 Love the stenciled heart and sweet cupid!